Proteus mirabilis (P. mirabilis) is a species of Gram-negative and facultative anaerobic bacteria that shows swarming motility and urease activity. Proteus ranked third as the cause of hospital-acquired infections . The organism is rod-shaped and motile bacterium with diverse mode of transmission . P. mirabilis is a common causative organism of urinary tract infection (UTI) in the complicated urinary tract, most frequently in patients with the indwelling catheters or structural abnormalities of the urinary tract . It expresses various virulence factors which are involved in uropathogenesis like adhesins (i.e., PMP fimbriae), motility (i.e., flagella) toxins (i.e., hemolysin and Proteus toxic agglutinin), quorum-sensing (i.e., cell-cell communication), enzymes (i.e., urease) and immune invasion (i.e., metalloproteinase - ZapA) . The infection is more prone to male than female . In hospitals, it is the second most frequently isolated Enterobacteriaceae species after Escherichia coli. The wild-type isolates of this species are more susceptible to β-lactams antimicrobials . The organism possess a black-brown colour pigment, which behaves like a melanin in many respects, such as solubility, bleaching by oxidizing agents and positive response to the Fontana-Masson assay . 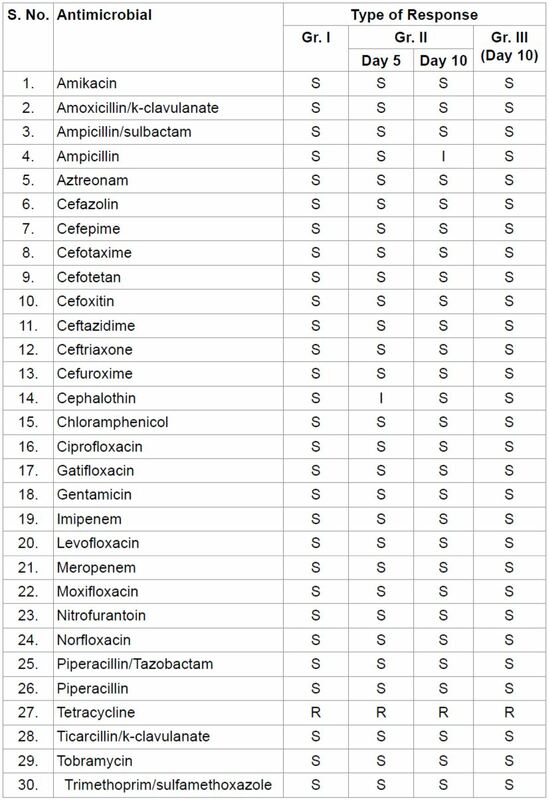 Most types of antibiotics are sensitive to P. mirabilis such as penicillin’s, cephalosporins, aminoglycosides, refamycin, fluoroquinolones, and phenicols while resistant to amoxicillin, cefotaxime and carbenicillin [8,9]. Therefore, an alternative strategy is needed against P. mirabilis infection. Biofield treatment has been known and popularized as an alternative approach that may be useful for the assessment of sensitivity profile of the organism [10-12]. The human body can emits the electromagnetic waves in the form of bio-photons, which surrounds the body and it is commonly known as biofield. Therefore, the biofield can generate by moving electrically charged particles (ions, cell, molecule, etc.) inside the human body. According to Rivera-Ruiz et al., it was reported that electrocardiography has been extensively used to measure the biofield of human body . Thus, human has the ability to harness the energy from environment or universe and can transmit into any living or nonliving object(s) around the Globe. The objects always receive the energy and responding into useful way that is called biofield energy and the process is known as biofield treatment. Biofield (putative energy fields) or electromagnetic based energy therapies, used to promote health and healing had been exclusively reported by National Institute of Health/National Center for Complementary and Alternative Medicine (NIH/NCCAM) . Mr. Trivedi’s unique biofield treatment (The Trivedi Effect®) has been known to transform the structural, physical and thermal properties of several metals and ceramic in materials science [15-17], improved the overall productivity of crops [18,19], and improved growth and anatomical characteristics of medicinal plants [20,21]. Due to the clinical significance of this organism and literature reports on biofield treatment, the present work was undertaken to evaluate the impact of biofield treatment on P. mirabilis in relation to their antimicrobials susceptibility, biochemical reaction, and biotyping. P. mirabilis, American Type Culture Collection (ATCC 25933) strain was procured from MicroBioLogics, Inc., USA and stored with proper storage conditions until further use. All the tested antimicrobials and biochemicals were procured from Sigma-Aldrich (MA, USA). The antimicrobial susceptibility, biochemical reactions and biotype number were estimated with the help of MicroScan Walk-Away® (Dade Behring Inc., West Sacramento, CA, USA) using Negative Breakpoint Combo 30 (NBPC 30) panel with respect to control group (Gr.). Two ATCC 25933 samples A and B of P. mirabilis were grouped (Gr.). ATCC A sample was revived and divided into two parts named as Gr.I (control) and Gr.II (revived, treated); likewise, ATCC B was labeled as Gr.III (lyophilized, treated). Mr. Trivedi provided the biofield treatment through his energy transmission process to the treated groups without touching the samples. In this process energy is transferred to the absorbing medium (sealed microbial samples) and this may cause several changes to occur within the absorbing medium. The treated samples were assessed for the antimicrobial sensitivity, biochemical reactions, and biotyping as per experimental design. Whilst handing over these cultures to Mr. Trivedi for retreatment purposes, optimum precautions were taken to avoid contamination. Investigation of antimicrobial susceptibility of P. mirabilis was carried out with the help of automated instrument, MicroScan Walk-Away® using NBPC 30 panel. The panel can be stored at 2 to 25°C for analysis. The panel was allowed to equilibrate to room temperature prior to rehydration. The tests carried out on MicroScan were miniaturized of the broth dilution susceptibility test that has been dehydrated. Briefly, the 0.1 mL of the standardized suspension of P. mirabilis was pipetted into 25 mL of inoculum water using pluronic and inverted 8 to 10 times and inoculated, rehydrated, and then subjected to incubation for 16 hours at 35°C. Rehydration and inoculation was performed using the RENOK® system with inoculators-D (B1013-4). 25 mL of standardized inoculum suspension was poured in to inoculum tray. The detailed experimental procedure and conditions were followed as per the manufacturer's instructions. MIC is defined as the lowest concentration of an antimicrobial that inhibits the visible growth of a microorganism after overnight incubation. The antimicrobial susceptibility pattern (S: Susceptible, R: Resistant; and I: Intermediate) and minimum inhibitory concentration (MIC) values were determined by observing the lowest antimicrobial concentration showing inhibition of growth . Biochemical reactions of P. mirabilis were determined using MicroScan Walk-Away®, system with NBPC 30 panel. The preparation of NBPC 30 panel, inoculum followed by dehydration and rehydration was performed similar way as mentioned in antimicrobial susceptibility assay for analysis of biochemical reaction followed by biotype number. The detailed experimental procedures and conditions were followed as per the manufacturer's instructions . The biotype number of P. mirabilis was determined on MicroScan Walk-Away® processed panel data report with the help of biochemical reactions data . Table 1: Antibiogram of Proteus mirabilis: Effect of biofield treatment on antimicrobial susceptibility. Table 2: Effect of biofield treatment on Proteus mirabilis to minimum inhibitory concentration (MIC) value of tested antimicrobials. 16 µg/mL) in Gr. II on day 10 as compared to the untreated group. In additionally, cephalothin was converted from S to I with increase of MIC value by two-fold (≤ 8 to 16 µg/mL) in Gr. II on day 5 as compared to the Gr. I. The decrease susceptibility and increase MIC value were well supported with literature . The susceptibility and MIC data of both antibiotics ampicillin and cephalothin were well correlated in this experiment. The MIC value of nitrofurantoin was slightly increased in Gr. II on day 10 as compared to the control. Overall, the treated cells of P. mirabilis showed 9.38% alteration in MIC values of tested antimicrobials. Rest of the antimicrobials did not show any alteration in terms of antimicrobial susceptibility and MIC values as compared to control. Table 3: Effect of biofield treatment on Proteus mirabilis to the biochemical reaction pattern. tested biochemicals such as adonitol (ADO), arabinose (ARA), esculin hydrolysis (ESC), nitrofurantoin (FD64), kanamycin (K4), lysine (LYS), malonate (MAL), melibiose (MEL), raffinose (RAF), rhamnose (RHA), sorbitol (SOR), and sucrose (SUC) were converted from negative (-) to positive (+) reaction in revived treated group (Gr. II) on day 10, as compared to the control. However, it did not show any change in others groups. Cephalothin was converted from negative (-) to positive (+) reaction in revived treated group (Gr. II) on day 5, while did not produce any effect on others treated samples as compared to the control. Moreover, penicillin showed positive (+) reaction in Gr. II (both days 5 and 10), while did not show any response in lyophilized treated group (Gr. III) as compared to the control (i.e., negative reaction). Overall, the treated cells of P. mirabilis showed 42.42% alteration in biochemical reaction pattern of tested antimicrobials. Based on literature there was two types of reaction phenomenon of indole, i.e., indole positive P. mirabilis and indole negative P. mirabilis . In this experiment based on the findings of biochemical reaction it is assumed that the strain is indole negative. 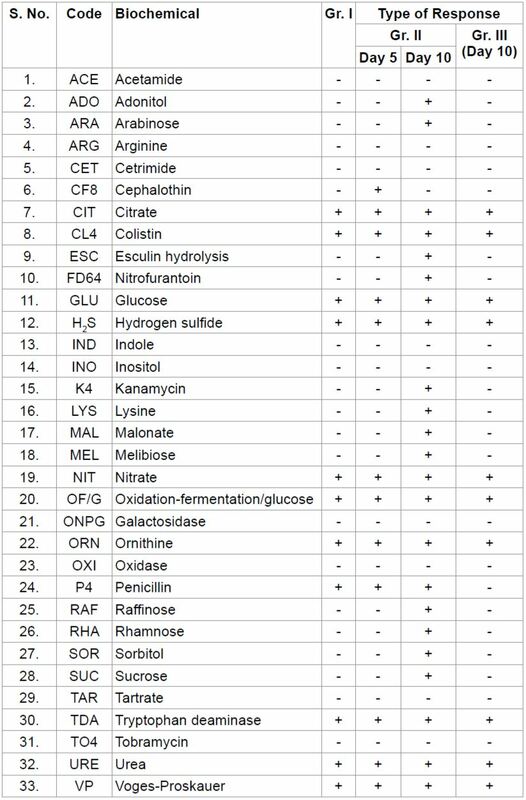 Rest of the biochemicals did not show any alteration of biochemical reactions in all the treated groups as compared to the control (Table 3). The species (P. mirabilis) was identified based on variety of conventional biochemical characters and biotyping. Biotype number of particular organism was evaluated after interpreting the results of the biochemical reactions. The biotype number then led to the particular organism identification. In this experiment, biotyping was performed using automated systems, and results showed significant change in biotype number (77365764) in the biofield treated Gr. II (on day 10) as compared to control Gr. I (40061544). Although, the organism was not altered after biofield energy treatment. The biotype number was also changed in Gr. II on day 5 (40061546) as compared to the control. Rest of the group (Gr. III) did not show any alteration of biotype number after biofield energy treatment as compared to their respective control (Table 4). Biofield treatment might be responsible for alteration in microorganism at enzymatic and/or genetic level, which may act on receptor protein. While altering receptor protein, ligand-receptor/protein interactions may altered that could lead to show different phenotypic characteristics . Biofield treatment might induce significant changes in revived strain of P. mirabilis and altered antimicrobials susceptibility pattern, MIC values, biochemical reactions, which ultimately change the biotype number of microorganism. As a result, the microbe that was susceptible to a particular antimicrobial in control sample now converted into intermediate in the treated cells of P. mirabilis predominately after biofield energy treatment. In this experiment, the main objective was to see the impact of Mr. Trivedi’s biofield energy treatment on an opportunistic hospital acquired pathogen of P. mirabilis in in vitro. Based on the findings of antimicrobial susceptibility pattern of ampicillin and cephalothin showed that the susceptible nature of both control samples and it became intermediate on Gr. II. So far our group had been published many research articles regarding the effect biofield treatment on ATCC and multidrug resistant (MDR) strains [17-19]. Based on these results, it is expected that biofield treatment has the scope to be an alternative approach than the existing antimicrobial therapy in near future. Altogether, the biofield treatment showed 6.67% alteration in antimicrobial susceptibility pattern with 9.38% change in MIC values of tested antimicrobials against the strain of P. mirabilis. It also significantly altered the biochemical reactions pattern (42.42%) and biotype number of biofield treated strain of P. mirabilis. The biotype number was changed in the treated group II on day 5 (40061546) and on day 10 (77365764) as compare to the control (40061544) without alteration of microbes. Thus, Mr. Trivedi’s unique biofield energy treatment could be applied as alternative therapeutic approach against antimicrobials in future. Table 4: Effect of biofield treatment on biotype number of Proteus mirabilis. 1. Bahashwan SA, Shafey HM (2013) Antimicrobial resistance patterns of Proteus isolates from clinical specimens. ESJ 9: 188-202. 2. Herter CA, Broeck CT (1911) A biochemical study of Proteus vulgaris Hauser. J Biol Chem 9: 491-511. 3. Warren JW, Tenney JH, Hoopes JM, Muncie HL, Anthony WC (1982) A prospective microbiologic study of bacteriuria in patients with chronic indwelling urethral catheters. J Infect Dis 146: 719-723. 4. Armbruster CE, Mobley HL (2012) Merging mythology and morphology: the multifaceted lifestyle of Proteus mirabilis. Nat Rev Microbiol 10: 743-754. 5. Hassen TF (2008) Study of Proteus mirabilis infections in Al-Nassiria city. J Thi-Qar Unv 3: 9-17. 6. Champs C, Sirot D, Chanal C, Sirot J (1999) A survey of extended-spectrum?-lactamase in Enterobacteriaceae in France. In Program and Abstracts of the Thirty-Ninth Interscience Conference on Antimicrobial Agents and Chemotherapy, American Society for Microbiology, Washington, DC. 7. Agodi A, Stefani S, Corsaro C, Campanile F, Gribaldo S, et al. (1996) Study of a melanic pigment of Proteus mirabilis. Res Microbiol 147: 167-174. 8. Bret L, Chanal C, Sirot D, Labia R, Sirot J (1996) Characterization of an inhibitor-resistant enzyme IRT-2 derived from TEM-2 beta-lactamase produced by Proteus mirabilis strains. J Antimicrob Chemother 38: 183-191. 9. Saurina G, Quale JM, Manikal VM, Oydna E, Landman D (2000) Antimicrobial resistance in Enterobacteriaceae in Brooklyn, NY: epidemiology and relation to antibiotic usage patterns. J Antimicrob Chemother 45: 895-898. 10. Trivedi MK, Patil S, Shettigar H, Bairwa K, Jana S (2015) Phenotypic and biotypic characterization of Klebsiella oxytoca: An impact of biofield treatment. J Microb Biochem Technol 7: 203-206. 11. Trivedi MK, Patil S, Shettigar H, Gangwar M, Jana S (2015) An effect of biofield treatment on multidrug-resistant Burkholderia cepacia: A multihost pathogen. J Trop Dis 3: 167. 13. Rivera-Ruiz M, Cajavilca C, Varon J (2008) Einthoven's string galvanometer: the first electrocardiograph. Tex Heart Inst J 35: 174-178. 14. Koithan M (2009) Introducing Complementary and Alternative Therapies. J Nurse Pract 5: 18-20. 17. Trivedi MK, Tallapragada RM (2009) Effect of super consciousness external energy on atomic, crystalline and powder characteristics of carbon allotrope powders. Mater Res Innov 13: 473-480. 22. Fader RC, Weaver E, Fossett R, Toyras M, Vanderlaan J (2013) Multilaboratory study of the biomic automated well-reading instrument versus MicroScan WalkAway for reading MicroScan antimicrobial susceptibility and identification panels. J Clin Microbiol 51: 1548-1554. 23. Feglo PK, Gbedema SY, Quay SNA, Adu-Sarkodie Y, Opoku-Okrah C (2010) Occurrence, species distribution and antibiotic resistance of Proteus isolates: A case study at the Komfo Anokye Teaching Hospital (KATH) in Ghana. IJPSR 1: 347-352. 24. 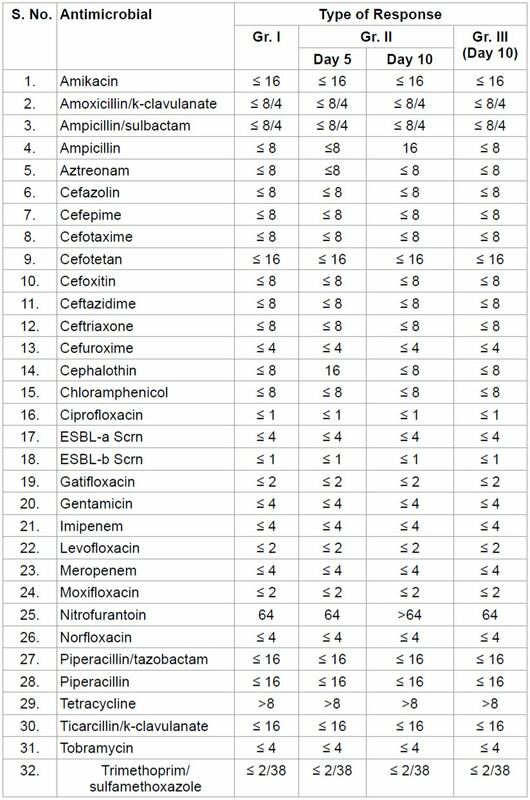 Wang J, Chen P, Chang S, Shiau Y, Wang H (2014) Antimicrobial susceptibilities of Proteus mirabilis: A longitudinal nationwide study from the Taiwan surveillance of antimicrobial resistance (TSAR) program. BMC Infect Dis 14: 486. 25. Matsen JM, Blazevic DJ, Ryan JA, Ewing WH (1972) Characterization of indole-positive Proteus mirabilis. Appl Microbiol 23: 592-594. 26. Lindstrom E, Mild KH, Lundgren E (1998) Analysis of the T cell activation signaling pathway during ELF magnetic field exposure, p56lck and [Ca2+] i-measurements. Bioeletrochem Bioenerg 46: 129-137.